I was a very conscientious parent. I dutifully read numerous parenting books and took great pleasure in being with my young children but, as they grew, the tricks and strategies from my parenting books began to fail. By the time my eldest was eight, parenting had become a huge disappointment to me. I longed to spend positive time with my children– playing games, taking them to the park, reading books – and yet most of our time together had degenerated into fighting, nagging and screaming and I wasn’t behaving much better than they were. We had one child who frequently hit, kicked, and punched the rest of us. After school and every weekend consisted of large slabs of time when, following an incident, my husband or I would carry him kicking and screaming to his room, force him inside, and stand there holding the door shut while he yelled and threw things around. When he finally calmed down enough to come out, he did so defiantly and often did something else immediately which meant we had to go through the whole process again. Despairing of spending all weekend holding onto a door handle, we began to put him outside instead. This resulted in him running around the house ripping flyscreens off the windows and causing as much havoc in the yard as possible. Getting him outside safely was an effort in itself. I worried that he could get seriously hurt in the battle to get him out and close the door behind him. I also worried about what the long-term impact of all of this was going to be. The other kids certainly weren’t angels either, they were very demanding and the stress level in the household was extremely high. Even when life was relatively calm, I was on edge, waiting for the next round of trouble. I just wanted to get away on my own and found myself resenting time with them – even to play or read. Time out, punishments, rewards, removal of privileges, natural consequences, logical consequences, positive reinforcement, and sticker sheets recommended by some parenting experts, – you name it, we tried it and it didn’t work for very long. After all my high ideals and dreams about parenting, it had become all work and little joy. At that stage, I enrolled in a Parent Effectiveness Training P.E.T. course in Melbourne and not long afterwards also began educating the boys at home. In the short-term, the bad behaviour that had been confined to weekends and after school times, spread out to cover the entire week and I found plenty of opportunities to practice my somewhat shaky P.E.T. skills. 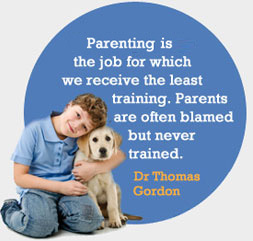 Gradually our parenting focus moved from discipline to relationship building. Within a couple of months I noticed that, rather than take the ironing into another room and closing the door to get away from the kids, I was ironing where they were playing – actually enjoying being with them and being drawn into their conversations and games. Around the same time, one son came to me and exclaimed joyfully that he was making friends with his brother again. We never looked back. For us, the combination of P.E.T. and home education created the childhood I wanted for my children and built strong relationships. My three sons are now all teenagers and are all pleasant, responsible and a joy to be with – a far cry from the delinquents I feared I might have. I can’t recommend P.E.T. more highly. I have never felt that I truly mastered P.E.T. or practised it well and yet we’ve still felt so much benefit. Initially, it seemed quite pricey but my husband and I looked at it from the point of view of ‘think of what we might save’ rather than the cost. Relationships are the key to a happy life and P.E.T. truly helped us develop positive relationships with our boys. We even found benefits for our already very happy marriage.